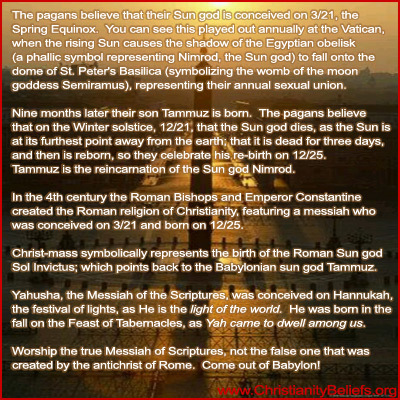 This End Times Deceptions Bible study shows that Messiah was born in the fall, not in the winter on December 25th. Scriptures tell us that Messiah was born six months after John the Baptist. John never ate bread nor drank wine (Luke 7:33), perhaps symbolizing that leaven nor alcohol tainted the purity of his words. When we add six months to John’s birth, we arrive at the 15th day of the 7th month, Tishri – the first day of the Feast of Tabernacles. The word ‘dwelt‘ in the Greek is skenoo from 4636; to tent or encamp, i.e. (figuratively) to occupy (as a mansion) or (specially), to reside (as God did in the Tabernacle of old, a symbol of protection and communion):— dwell. It is derived from 4636 Skenos, which points to the human body, as Yah became flesh in Yahusha. skenos skay’-nos; a hut or temporary residence, i.e. (figuratively) the human body (as the abode of the spirit):—tabernacle. So we have a direct match of Yah becoming flesh through Messiah to dwell among us. The Feast of Tabernacles is an 8-day festival, and since males were circumcised on the 8th day, Messiah would have been circumcised on the last day, in the temple, when His blood would have been shed. On this day the Jews complete their annual cycle of Torah readings and start again from Genesis. The circumcision of Messiah at this time indicates how He had come to fulfill the Law and Prophets. Backing up 9 months from the Feast of Tabernacles would place the time of Mary’s divine pregnancy happening around the time of Hanukkah, the festival of lights, which falls on the 25th of the 9th Biblical month. Hanukkah is the feast of the renewing, or of the renovation. It’s a remembrance of the time when the temple was cleansed after it was defiled by Antiochus Epiphanes. Messiah came to offer the renewed covenant, the covenant made with Abraham to those who believe in Him by faith; and he ratified the covenant with His blood as the Passover Lamb. He put aside the temple made by men and created a new temple, with Himself as the cornerstone, the Apostles as the foundation, and the saints forming the building, which the Spirit indwells. Mary and Joseph were in Bethlehem because of the required Roman census during the Feast of Tabernacles. King Herod would have chosen the Feast of Tabernacles to perform the census, as Jews would have been gathered in Jerusalem anyway because it was required to attend the feast. To house the over two million Jews who had gathered for the feast day, there were many booths outside of Jerusalem, for them to observe the Feast of Tabernacles in. Messiah most likely was born in one of these booths, symbolizing Elohim coming to tabernacle among us. They used a feeding trough to lay Him in, as they had no cradle. Perhaps this points to Him being the Lamb of Elohim. The swaddling clothes most likely were the strips of cloth from the garments of priests, as Messiah became our High Priest. Messiah was not born in the winter, as the Shepherds were still in the fields as the sheep were in the pasture. We know that Messiah started His ministry at age 30, during the Feast of Tabernacles. Per Daniel 9, He started His ministry in the fall of 27 A.D.; He ministered for 3 1/2 years, until he was cut off, killed, as the Passover Lamb in Spring of 31 A.D.
Messiah celebrated the Feast of Tabernacles, His birthday, on a mountain with three of His disciples. Peter offered to make tabernacles, the temporary home of the Feast of Tabernacles, for Messiah, Moses and Elijah. Here is a video from Pastor Mark Biltz called The birth of the Messiah revealed in scripture. He wanted everyone there to witness Messiah’s birth, the Holy Spirit being poured out, and His death. Jewish historian Josephus documented that there would have been around 2 1/2 million Jews in Jerusalem during Messiah’s birth and death. During the Feasts, they would sing Psalm 118, which pointed to Messiah. It is supposed by many that our blessed Saviour was born much about the time of this holiday[Feast of Tabernacles]; then He left his mansions of light above to tabernacle among us (John 1:14), and he dwelt in booths. And the worship of God under the New Testament is prophesied of under the notion of keeping the feast of tabernacles, Zec.14:16. The gospel of Christ teaches us to dwell in tabernacles, to sit loose to this world, as those that have here no continuing city, but by faith, and hope and holy contempt of present things, to go out to Christ without the camp, Heb. 13:13, 14.